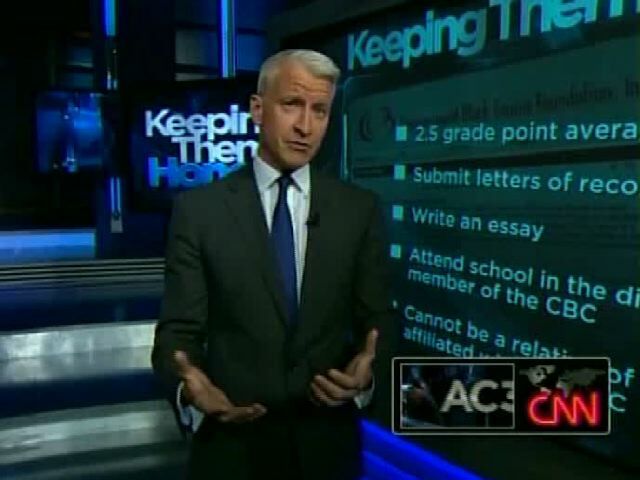 Tuesday's AC360 opened with Anderson Cooper presenting an overview of the night's topics. From the POTUS speech to the nation, more Mosque fears and Hurricane Earl. 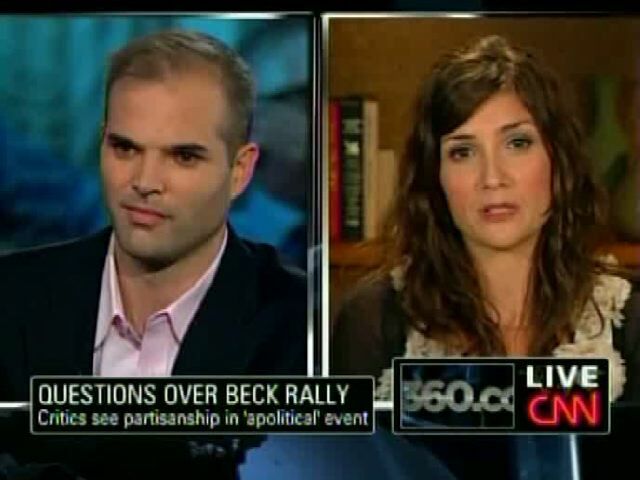 TENNESSEE MOSQUE EXPANSION UNDER FIRE, Opponents allege terror links: Anderson Cooper 'Keeping Them Honest' interviewed Laurie Cardoza-Moore (President of Proclaiming Justice to the Nations) and Camie Ayash (spokeswoman Islamic Center of Murfreesboro). SHARIA SHOCK, Poll: Majority of GOP thinks President favors Muslims: A discussion with Fareed Zakaria, Paul Begala, David Gergen and Ari Fleischer. SEN. LISA MURKOWSKI IN ALASKA GOP SENATORIAL PRIMARY: Discussion with the panel of Gergen, Zakaria, Fleischer, Begala and Peter Bergen on Murkowski's upset, her nemesis Sarah Palin and then the President's speech. Once again this year Anderson Cooper is slated to emcee the Elton John AIDS Foundation (EJAF) benefit. At the Enduring Vision gala on October 18, Jimmy Choo founder and CCO Tamara Mellon will take the stage at Cipriani Wall Street to receive an award for her support of John's organizations. Others to be recognized at the gala include Victor Pinchuk and Elena Franchuk, who have worked to expose the AIDS epidemic in the Ukraine, and EJAF supporters Jeffrey and Marilyn Katzenberg. The night, which raised $2 million last year and will once again be hosted by CNN's Anderson Cooper, will also include performances by Elton John and Leon Russell. Fashion industry titans Donna Karan and Evelyn and Leonard Lauder of Estee Lauder, along with Steven Spielberg, David Geffen and others, will serve as co-chairs of the big night. The picture is from the event in 2007 and is Sir Elton, AC and David Furnish (EJ's civil partner). The podcasts have not been updated since August 27th. Anderson was back in NYC and opened tonight's program with "Thanks for joining us. 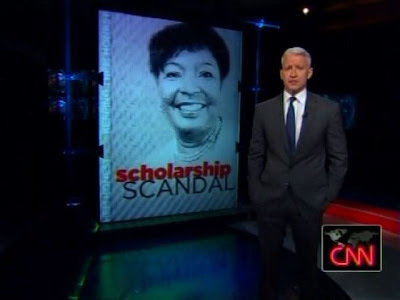 Tonight, keeping them honest, the Congresswoman and the scholarship scandal. The Texas democrat has been doling out thousands in scholarship money to her relatives and one of her staffer's kids. The money is from charitable tax deductible donations. She says she didn't know the rules. But it turns out she broke more than one and she's been doing it for years. 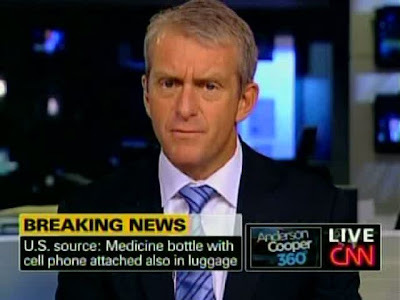 Also tonight, breaking news, was it a practice run to blow up a U.S. jetliner? Here's what we know: bottles of liquid with watches and cell phones attached inside checked luggage on a flight out of Chicago. Question is does it add up to terrorist testing what could actually get into the cargo of a U.S. passenger plane? The very latest on the devices and the two men now in custody. 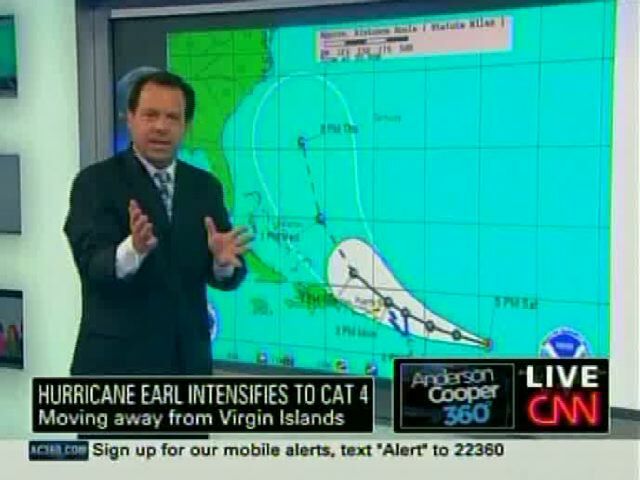 Also tonight, up close, the latest on hurricane Earl now a category four storm and building taking aim on the east coast." 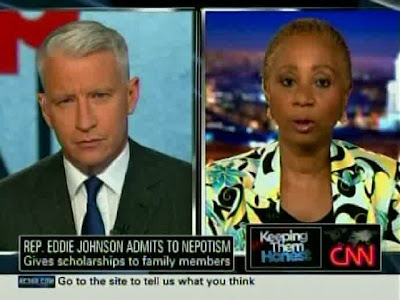 REP. EDDIE JOHNSON ADMITS TO NEPOTISM: Interview with Muriel Cooper, Congressional Black Caucus Fdn. As our first day comes to a close, we sit in our hotel room feeling a huge mix of emotions: exhausted (from being up since 3 am), excited, inspired, curious and motivated. One of our most exciting moments of the day occurred after the CNN Express bus pulled up right outside our hotel. Obviously, we jumped at the chance to get a closer look and were invited in by the friendly bus driver Dale. He gave us the grand tour which included a 42 inch retractable television and 11 other small televisions, the private bathroom, technical control room (with a $25,000 camera lying out) and camera supply closet. Unfortunately, we just missed Anderson Cooper but came off the bus with some pretty cool Anderson Cooper CNN beads and a book mark. As we walked along the streets later that night, we continued to see news vans and camera crews scattered everywhere either prepping for the nightly news live shot or wrapping up for the day. We of course had to make a pit-stop at Café du Monde on our way back for some world famous beignets- so delicious! But after going for 18 hours straight, there’s nothing that sounds better right now than crawling into a warm bed. We’re excited for everything we have planned tomorrow including a trip to the 9th ward (and a possible Brad Pitt sighting?!?) so stay tuned for more coverage tomorrow! 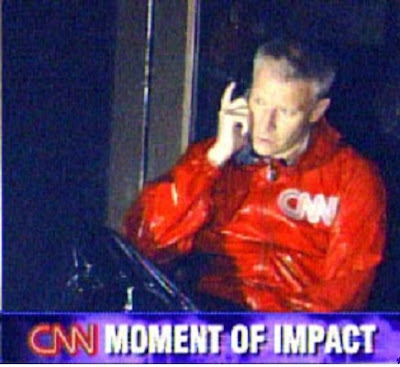 Okay, I'm still riding on a high after meeting Anderson Cooper on Thursday. On Friday, knowing that none of my team wanted to working at the parking lot, I decided to run it all day. Even in the rain, I sat under the tent until my team came to pick me up. It wasn't that bad though. Friday evening, he was coming back to the actual work site where we were working in order to film so several members of my team stayed back while the rest went home. Originally, I was going to stay at home but I ended up going back. While filming is taking place, I saw Katie standing over by where AC was filming so I decided to join her. Call me a creeper, even though I'm not. We were just talking and he looks over and says hi. He then tells me that he read my blog. In total disbelief! I was like, "my blog" and he was like, "Yes, your blog. Someone sent me the link and I read it". I was absolutely floored. And probably blushing. I mean, I know it's not a big deal or anything but when someone as huge as Anderson Cooper says that he read your personal blog, you get excited. I thought that was very nice of him to read it. 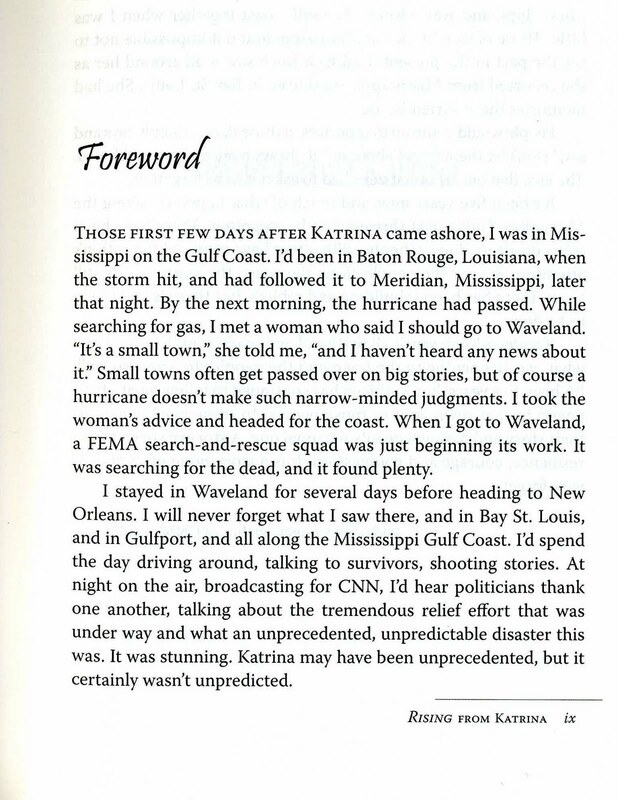 We left off last week with Anderson signing off from Waveland, MS. It was time to head back to NYC and the CNN studio. I managed to find a few extra "goodies" from that first month in the Gulf Coast, so we will start tonight with more from that time, before moving forward. 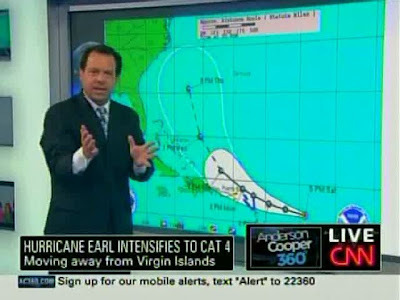 From CNN Reports - Katrina State of Emergency. 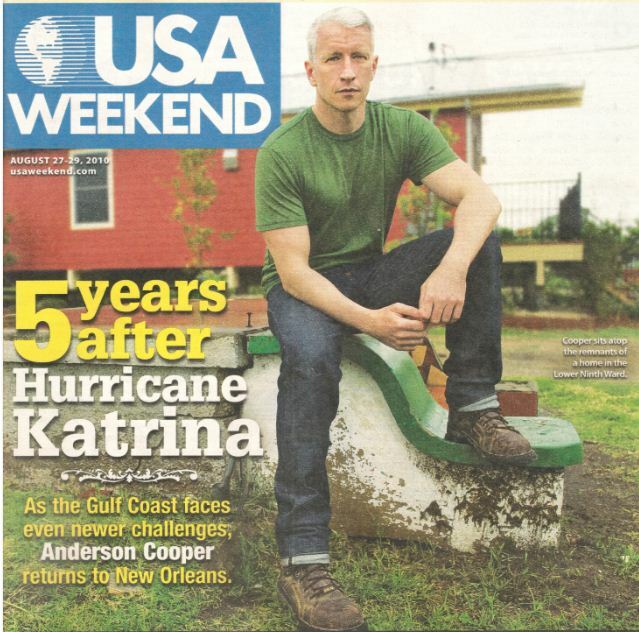 Anderson Cooper appeared on HBO's Bill Maher program from Biloxi, MS to discuss the failures on the ground. Anderson opened his broadcast on August 29, 2006 saying, "Thanks for joining us for this special hour of 360. You know, one year ago tonight we were just beginning to grasp the disaster unfolding here in New Orleans. 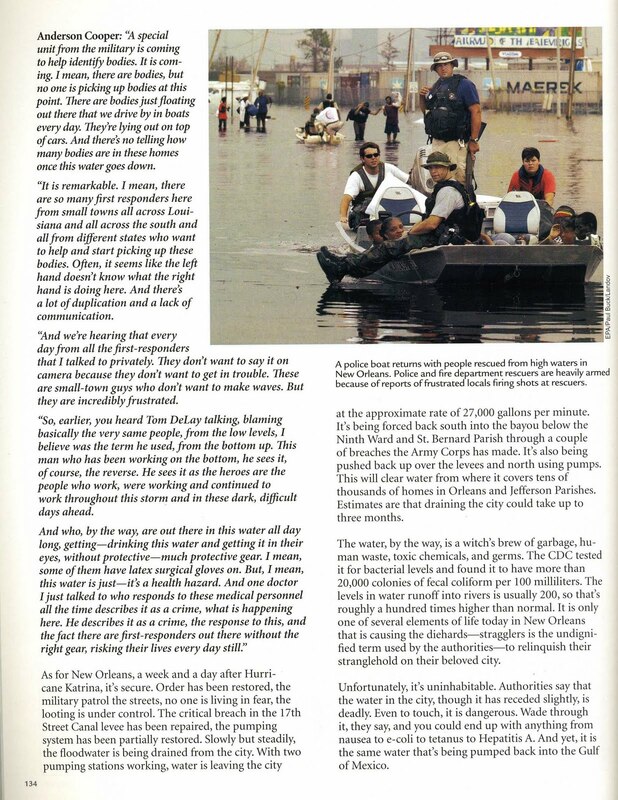 Water was pouring into the city fast, turning houses into death traps. Eventually 80 percent of the city would be flooded. It would get worse, of course, much worse before it was over. 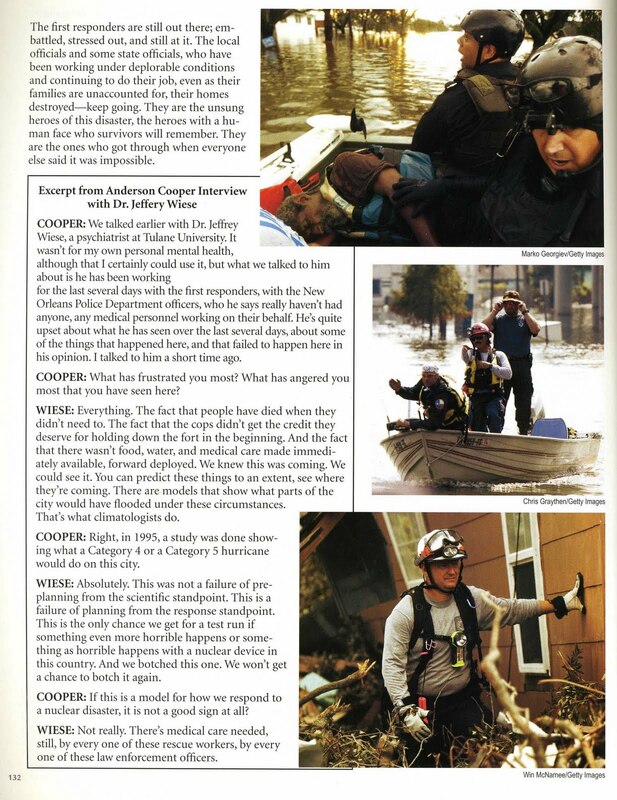 As the days ticked by and the death toll rose, it became horribly clear that human error had made the worst natural disaster in the U.S. history even deadlier. It turned it into a catastrophe." He closed that show saying, "A year ago we met a woman named Miss Connie. She was blind, living alone. She refused to leave the city if her dog, Abu, couldn't come with her. We've been down here dozens of times since the storm and we've always tried to find Miss Connie. We never could. And frankly, we feared the worst for her. That was Abu right there. Tonight, just minutes ago, we heard that Miss Connie is doing fine. She's living in London, Kentucky. And believe it or not, but her dog, Abu, is with her now, after all this time. That is some good news to end with tonight from New Orleans. It's been an honor and a privilege to report this story over the past year. And we will continue to report this story over the course of this next year. We will never forget." 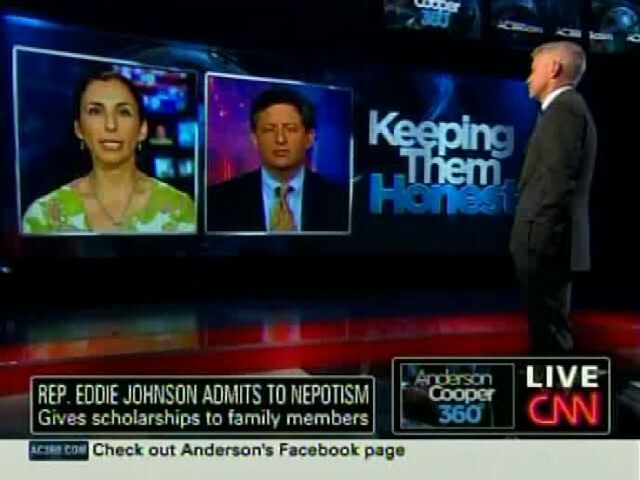 Anderson opened the August 29, 2007 edition of AC360 with, "Good evening. We don't care much for anniversaries on this program, solemn remembrances of stories long since past. But, tonight, we come to you from New Orleans to report on a story which is still very much unfolding. Two years ago tonight, these streets were filling with water. 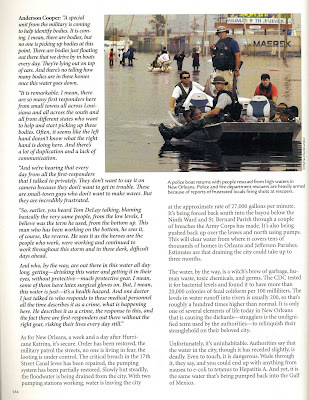 Levees poorly built over decade on shifting sands failed. 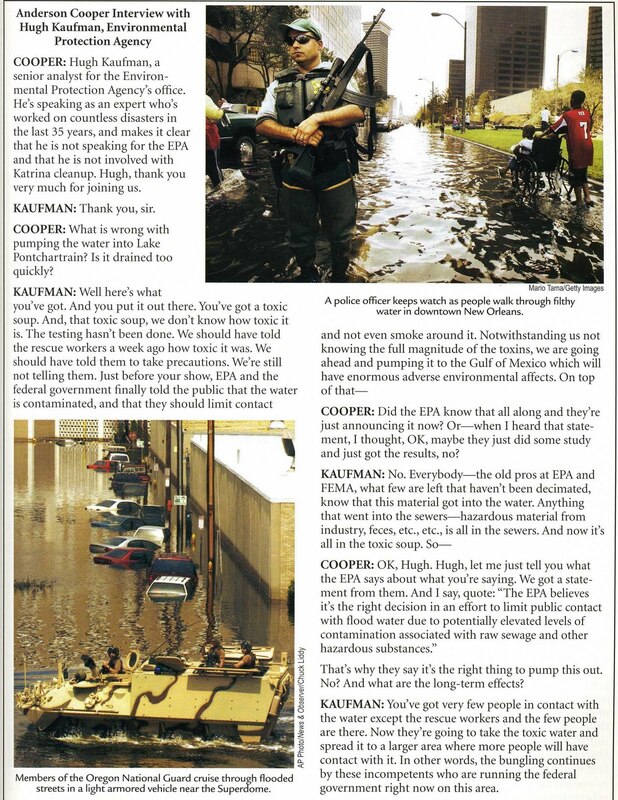 And, two years ago tonight, what was a natural disaster became very quickly a manmade one. Now, two years later, the recovery of this city, this region, is under way. And it, too, is manmade. Two years ago tonight, governments failed. The people here have not. 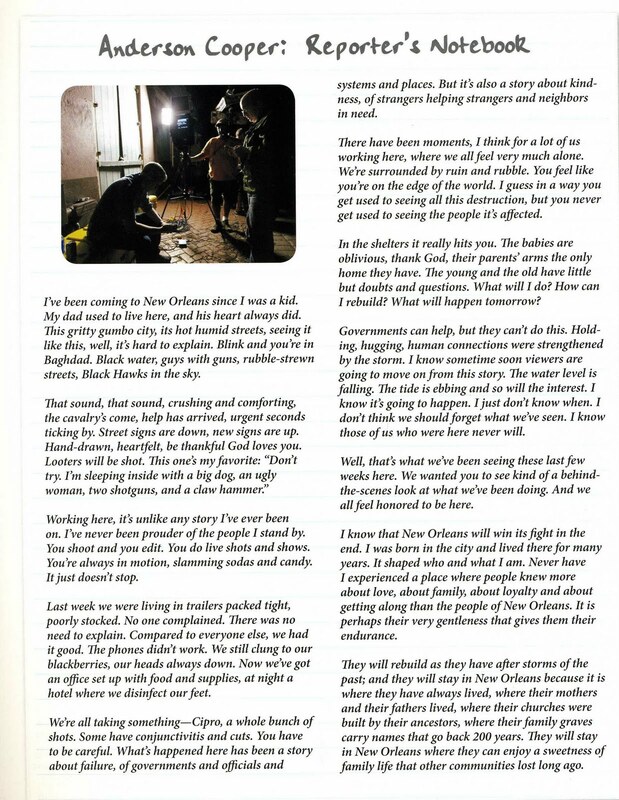 New Orleans is rising again." And closed the program saying, "We've met a lot of people ... over the past two years. It remains the one great privilege of the work here. Their patience and warmth with an outsider is welcome. Even more so, their willingness to share anything even when they're got next to nothing to give. 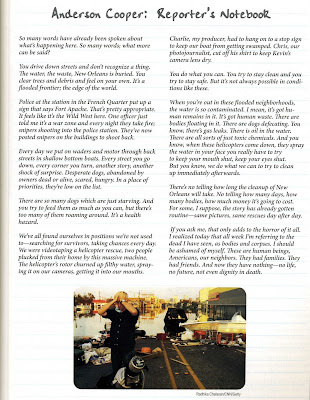 I say seemingly because in the past two years I've learned there's so much more to the people in New Orleans and the gulf and what you can see in an hour of television or a week or a month. And as much as I'm grateful for their time and their stories, I'll always consider that realization their true gift to me. That said, some quick thoughts on two years. I mentioned earlier that I'm not really big on anniversaries, especially ones recognized by television. They always seem artificial to me. Maybe I'm just cynical about TV. But whenever I hear a newscast making a big deal about the anniversary of an event, I always assume it must be a slow news cycle. ... 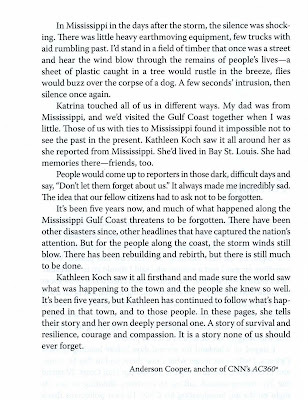 So why then on the second anniversary of Hurricane Katrina are we here in the Gulf Coast? 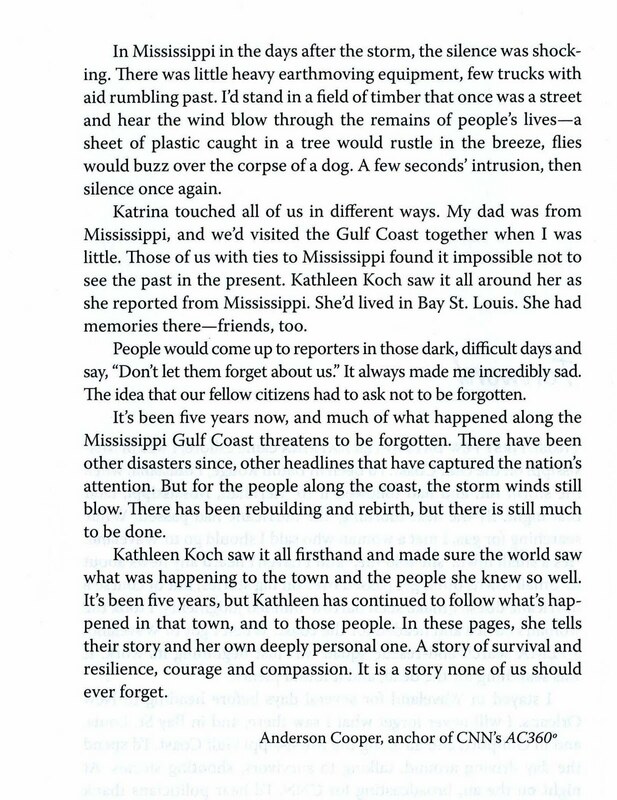 I guess it's because today more people around the country may be willing to take a few moments to remember what happened and what continues to happen here in New Orleans and Mississippi. ... I'm proud that CNN has remained committed to telling this story. A lot of other news organizations seem to have moved on. Katrina fatigue, that's what some people call it. 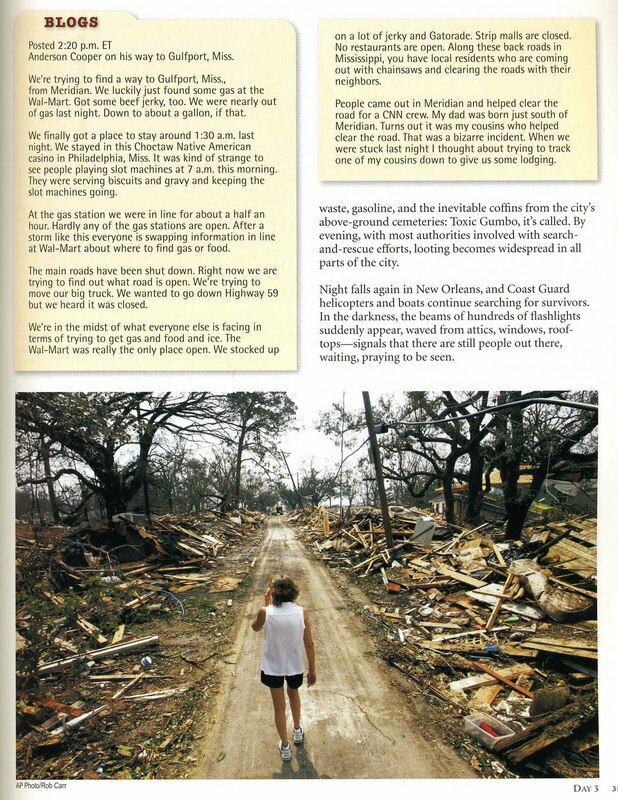 As anyone in New Orleans or the Mississippi Gulf Coast will tell you, the only people who have a right to Katrina fatigue are the people still waiting for their insurance company to reimburse them or those waiting for the long-promised Road to Home money, or those still trying to find help rebuilding their homes or their businesses. 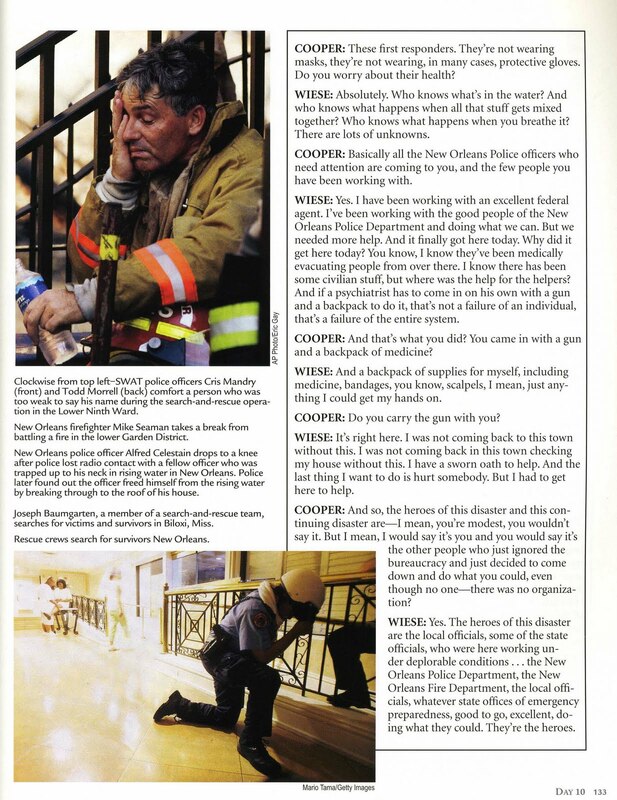 I know today a lot of reporters will descend on New Orleans, many for the first time since the last anniversary. I'm glad they're here. The city, this region needs all the coverage it can get. But let's not forget that tomorrow the cameras will leave. The television anchors will fly home, myself included, but the people and their problems will remain. It's not enough to only think of them on this yearly anniversary. What they're going through is happening every day, every week, month after month. Let's keep that in mind. Let's keep them in mind, not just today but every day until their lives, their homes are restored. 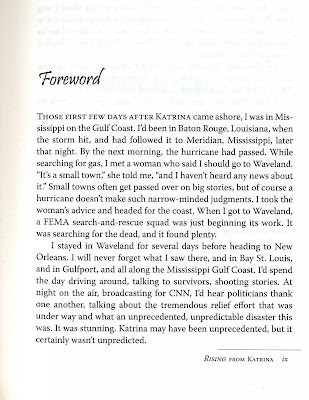 ... We look forward to that day when all of New Orleans and the Mississippi Gulf Coast is rebuilt and renewed. We promise, as we did two years ago, to continue to cover their struggle. Not just on this day but in the difficult days and weeks and months ahead." And Anderson ended the program with, "For tonight's "Shot," the sounds of New Orleans. This is Shamarr Allen and the Underdawgs. Jazz, blues. No matter the form, the music will always be heard and played here. It's part of the city. So what better way to celebrate the continued rebirth of New Orleans than with a song from local musicians? Listen." 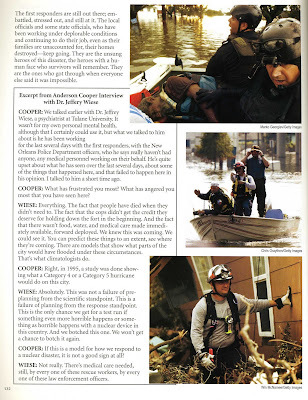 I hope you've enjoyed this look back on Anderson's reporting on Hurricane Katrina. Today, Sunday, August 29th, marks the Fifth Anniversary. Anderson payed tribute on Thursday night's AC360. If you missed that program, here's a link to the post. ~ Wonz. 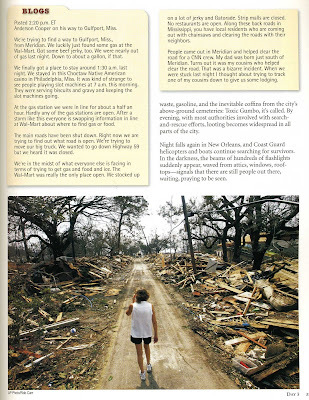 Today marks the fifth anniversary of Hurricane Katrina. Wonz did an excellent retrospective last Monday and has a few more clips planned for her post tomorrow. In going through the archives I found some of Anderson Cooper's original reports that I thought I'd share with you. 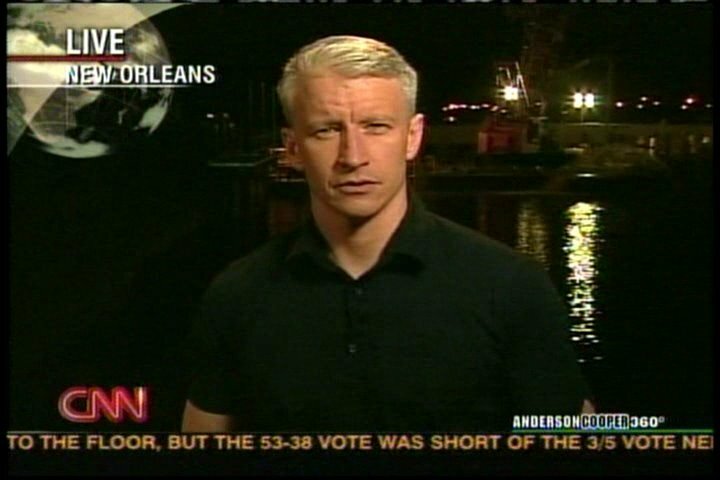 Anderson Cooper opened tonight's AC360 with, "Good evening again from New Orleans. Tonight: simply remarkable pictures from deep underground -- 33 Chilean miners alive, but now, for the first time, they're also fully aware that they could be down there until Christmas. How will they stay sane? How will they stay healthy? We will tell you about that, about new plans to get them out quicker, how safety problems possibly led to this problem and how problems here in the United States in mines are not being addressed. We're "Keeping Them Honest." Also tonight, Glenn Beck gets ready to hold a rally on the day and site where Martin Luther King Jr. spoke the words, "I have a dream." So, would this be Dr. King's nightmare? 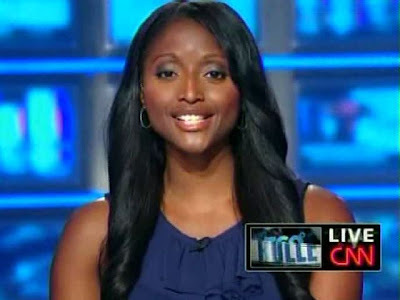 We are joined by his niece, whose position will surprise you, and the Reverend Al Sharpton. And we're here in New Orleans, where the folks for Habitat for Humanity are building houses for five families. They started on Tuesday. They will finish tomorrow, 200 people swinging hammers. 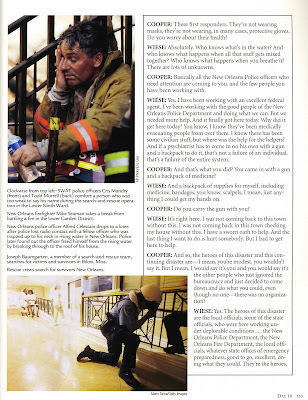 We will show you their very good work on this, coming up to the fifth anniversary of Hurricane Katrina. " 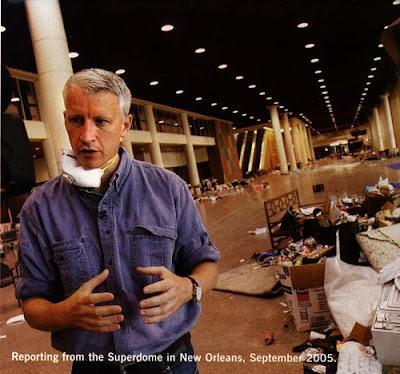 DANGEROUS REALITY: Anderson Cooper reports on mine safety in the U.S.
Today Mediaite talked to Cooper for a podcast about New Orleans five years later, what the press did wrong and his take on the upcoming new CNN prime time line-up. Here's a link to the full radio interview. In more trivial news, Cooper also commented on the widely circulated offer that came from a hair company, which promised him $1 million if he used their product, which they claimed would get rid of his trademark gray hair. "The only thing stupider than that product is the amount of coverage that this public relations effort has gotten," he said. "Even if there was such a product, which I have no knowledge of, I have no interest in changing my hair color." Anderson was up early today and joined John Roberts on American Morning. And here is the link to the blog of one lucky man who had the opportunity to meet Anderson on Thursday. Complete with photos! Yesterday afternoon, I received a call from my site supervisor asking if I could bring two people over to Musician's Village to help out with parking. When we arrived, Harry Connick Jr was filming a segment with CNN. After I got those two members situated with the security guard, I came back to the work site to pick everyone else up but none of my members wanted to go. Boring! Anyways, so I went back to watch the "topping off" ceremony with Harry, CNN, and Habitat. Afterwards, Kareem, Nick and I were walking back to the van when from across the street, we spot Mr. Anderson Cooper himself. 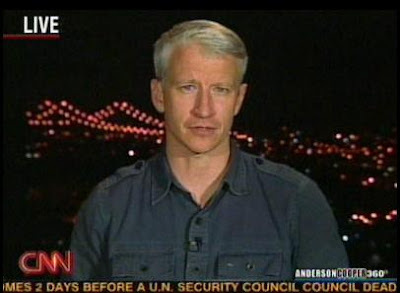 Nick - "Hey are you Anderson Cooper?" AC - "Yes I am." Nick - "Can we get a photo with you?" And that's how the photos happened. Later that evening, we all went back to Musician's Village to meet up with 90 members from the Southern region to be a part of the AC 360 show on CNN. That was pretty awesome. He came out and took lots of photos with us; the first being with Raven 7's own, Katie! You Go Girl! Hahahaha. We were a part of the whole show, just in case y'all didn't see. It was such an awesome experience and we got so many photos with him. Take a look below!